Bobby Mottley, 88, of Amherst, Va., passed away on Saturday, July 29, 2017, at Lynchburg General Hospital. Born in Buckingham County on August 30, 1928, he was the son of the late Joel Willie Mottley and Nannie Childress Mottley. He married Virginia Lee Walker of Amherst County in 1951. After his tour of duty in the U.S. Army, serving in the Military Police Division, they made their home in Amherst. He was hired as a police officer in Amherst, during a time when he and a few officers from the Sherriff's department, served the entire county. He became the first Police Chief for the town and served 41 years with the department before retiring. Bobby loved Amherst and its people and was known for his integrity and fairness. Over the years, whenever he saw a need or an opportunity to make the town better, he acted. He was a founder of the Amherst Rescue Squad in 1957, and initiated many projects that improved life for Amherst citizens. After retiring from the Police Department, he was elected to serve on the Town Council and held that position for many years. 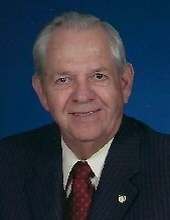 In addition, Bobby was an active member of Emmanuel United Methodist Church serving as church treasurer. He was also a member of Clinton Masonic Lodge 73 for over 60 years. He considered his wife, daughter, grandchildren and great-grandchildren to be his greatest source of pride. Bobby was preceded in death by his sisters, Virginia Mottley Rogers and Shirley Mottley; and brothers, William and Eugene Mottley. He is survived by his wife, Virginia; daughter, Deborah Mottley Baughman (husband, Allen); granddaughters, Whitney Baughman Altizer (husband, Brooks), Caitlin Baughman Raines (husband, Fred); and great-grandsons, Asa and Zeke Altizer; sister, Mary Lee Chernault; and brothers, Earl and Kirby Mottley; brother-in-law, Carlton Walker (wife, Kittie); and many nieces and nephews. Visitation will be held on Tuesday, August 1, 2017, from 4:30 to 6:30 p.m. at Driskill Funeral Chapel of Amherst. A funeral service led by the Rev. Nancy Johnson will be held on Wednesday, August 2, 2017, at 11 a.m. at Emmanuel Methodist Church. Interment will follow at Amherst Cemetery. Family and friends are invited to celebrate Bobby's life at a reception at the church following the service. The family requests that memorial contributions be made to Emmanuel United Methodist Church. In addition, the family would like to thank the staff at Runk and Pratt Assisted Living Community on Leesville Road for their care and support. Driskill Funeral Home of Amherst, Va., will be serving the Mottley family. Online condolences may be made at www.norrisfuneralservices.com . To send flowers or a remembrance gift to the family of Bobby Mottley, please visit our Tribute Store. "Email Address" would like to share the life celebration of Bobby Mottley. Click on the "link" to go to share a favorite memory or leave a condolence message for the family.